BACKGROUND Approximately 2.5 billion people are at risk from dengue infection. Dengue is endemic to urban populations in tropical areas; large epidemics have occurred less frequently in subtropical regions, and rarely in cities in temperate regions. The virus is transmitted by the freshwater mosquito, Aedes aegypti. During the past century, surface temperatures have increased by a global average of 0.75°C. Temperature increases of this magnitude may be associated with substantial increases in dengue epidemic potential. OBJECTIVE We aimed to describe the geographic distribution of dengue transmission (current and historical) and to estimate possible impacts on transmission from climate change. METHODS We conducted two systematic reviews. We searched PubMed, digital books and archives for literature describing geographically defined outbreaks of dengue. 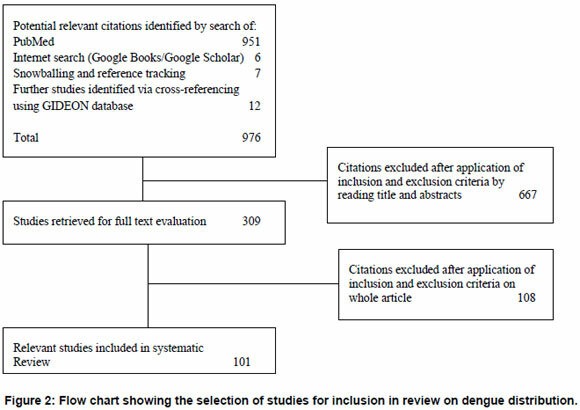 We also searched PubMed and Scopus for studies modelling the potential effects of climate change on dengue transmission. Data from studies meeting the inclusion criteria were considered by all of our team and we collaborated to draw our conclusions. No meta-analysis was attempted. RESULTS One hundred and one articles met the eligibility criteria for the first review; there were some contradictions and ambiguities in the data. Current global distribution of dengue is generally less extensive than historical limits of dengue-like illness. In recent years, several countries have reported local transmission of dengue for the first time, but it is unclear whether this represents true geographic spread, rather than increased awareness and reporting. Areas of geographic contraction of dengue include the southern states of North America, much of Australia, parts of southern Europe, Japan, China and South Africa. Piped water supplies, removal of water storage tanks, changes in housing conditions and vector control measures have plausibly contributed to this contraction. Six papers met the inclusion criteria for the second review. The findings of theoretical and statistical models of dengue and climate are broadly consistent: the transmission of dengue is highly sensitive to climate. Relatively small increases in temperature (around 1°C) can lead to substantial increases in transmission potential. Studies modelling the potential effects of climate change on dengue project that there will be increases in climatic suitability for transmission and an expansion of the geographic regions at risk of dengue during this century. CONCLUSIONS Geographic distribution of dengue has generally contracted, despite increases in global average temperature in the past century. Theoretically, however, temperature trends have increased the risk of dengue in some areas. The independent effect of climate change on historical patterns of dengue transmission cannot be quantified based on current evidence, as existing models of disease transmission provide limited, incomplete, projections of disease risk. The geographic limits of dengue result from a complex interaction between physical, ecological and social factors which have not been included in current climate change models. Keeping this limitation in mind, models estimating changes to geographic boundaries of transmission suggest an increase in the future population at risk of dengue. Factors associated with urban poverty and minimal capacities for surveillance and control measures remain important promoters of dengue transmission in regions with favourable climate. An estimated 2.5 billion people are at risk of dengue, in tropical and subtropical areas throughout the world (1). Dengue is mainly an urban and peri-urban disease, but also occurs in rural areas. Dengue infection causes a spectrum of disease, from mild flu-like symptoms to severe life threatening haemorrhage (2). 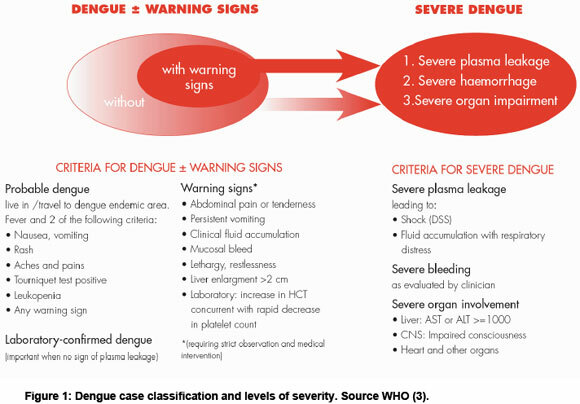 The definition of severe dengue is based on clinical features (see Figure 1) (3). There has been a dramatic increase in the incidence of dengue in the past 50 years and some geographic expansion of transmission (4). In particular, an intensive campaign was successful in interrupting dengue transmission in South America during the 1960s and 1970s, but mosquito control measures were not maintained and the disease has subsequently returned (4). Recently, local transmission of dengue has been reported for the first time in several African countries (see below), Bhutan; Nepal and France (5-7). Dengue has also returned after many decades of absence in Hawaii and Florida, USA (8,9). The reasons for the emergence of dengue are complex and not completely understood. Probable causes include increases in poor, urban populations, breakdown in public health measures, especially vector control programmes, increased travel and trade, and environmental disturbances (10-13). There is debate about the potential role of climate change as a contributor to global trends in vector borne diseases (14,15). Transmission of the dengue virus is sensitive to climate. Temperature, rainfall and humidity affect the breeding cycle, survival and biting rate of the mosquito vectors (principally Aedes aegypti). Higher ambient temperatures favour rapid development of the vector, increase the frequency of blood meals, and reduce the extrinsic incubation period (EIP). The EIP is the time taken between the vector ingesting an infective blood meal and it being able to transmit the virus in a subsequent feed. A short EIP increases the opportunities for virus transmission during the lifetime of an infected mosquito. If the ambient temperature is too low, mosquitoes are unlikely to survive long enough to become infectious and pass on dengue (11). Suitable climate is a necessary but, not on its own, sufficient factor for dengue transmission. A source of infection (either locally acquired or imported), a competent vector, and vector contact with a susceptible human population must all be present for dengue transmission to occur. Climatic conditions provide an absolute constraint on the geographic area suitable for transmission of dengue, but within climatically suitable areas, non-climate factors are important in determining the extent to which transmission of dengue actually occurs. 2.the potential effects of global climate change on dengue transmission. We hypothesize that, if changes in the geographic distribution of dengue correspond with long-term climate trends, this would suggest an important climate influence. Our primary focus was on the boundaries of current transmission, where geographic shifts of dengue epidemic activity were likely. PubMed, an online medical and life sciences database, was consulted for the retrieval of peer-reviewed articles on dengue outbreaks. In addition, digital books and archives were searched to retrieve documents on reports of outbreaks occurring before 1950. We retrieved articles relevant to the following countries and regions: Africa, Australia, Argentina, Chile, Uruguay, China, the Middle East, and the United States. For the Asia-Pacific region, we used data from a recent map produced by the World Health Organization (WHO). The Global Infectious Diseases and Epidemiology Online Network (GIDEON) database (http://www.gideononline.com) was used to cross-reference the PubMed search. GIDEON provides information on diagnosis and epidemiology, microbiology and antimicrobial chemotherapy of tropical and infectious disease. The database includes 224 countries and 337 diseases and is based on literature and reports from all over the world. GIDEON incorporates data from the Program for Monitoring Emerging Diseases (ProMED)-mail (http://www.promedmail.org). The PubMed database was searched using the terms "dengue", "disease outbreak" and "epidemiology" as free text. (Search: dengue (and possible synonyms)[ALL] AND disease outbreak (and possible synonyms)[ALL] OR epidemiology [ALL] to 2009.) These search terms were combined with the following region and country names of areas on the fringe of established transmission: Africa, Australia (except Queensland), Argentina, Chile, Uruguay, China, the Middle East, and the United States (except South Texas). c) dengue reports from countries outside the established transmission zone. We searched for published studies that modelled the potential impacts of climate change on either the dengue vector (Ae. aegypti) or on dengue cases. c)biological models of the relationship between the pathogen and/or vectors and climate, with reference to climate change. rather than existing seasonal or interannual effects (e.g. El Niño southern oscillation). Review articles were also excluded. The initial search resulted in 951 papers. Further steps in article selection are outlined in Figure 2. There were 101 articles that met the eligibility criteria, including twelve historical overviews. There were some contradictions and ambiguities in the available data on dengue cases. It is impossible to be certain that all reports of dengue-like illness were really dengue, since the symptoms of the disease are non-specific and serological results are often not available, especially in early reports. Dengue outbreak reports dating from before 1870 are considered less reliable (16). Infectious diseases commonly confused with dengue include: chikungunya, Rift Valley fever, Ross River fever, West Nile fever, yellow fever, influenza, malaria, measles, typhoid fever, leptospirosis, pappataci fever (sandfly fever), and scarlet fever. Chikungunya might be suspected if common features of dengue (such as rash, adenopathy and postorbital pain) were not present or if joint pains were present for a long period of time. Serological and virus-specific laboratory tests became available for the confirmation of dengue in 1950. (Dengue virus was isolated for the first time in 1943.) Certain outbreaks between 1920 and 1950 have been confirmed by retrospective serological studies. Historical overviews revealed several areas and countries where dengue-like outbreaks were reported before 1950 but not since. For example, dengue appeared frequently in Japan from 1900 to 1945 (17). The 1942-1945 outbreak was said to be one of the largest epidemics ever recorded in a temperate region. Dengue has disappeared from Japan since 1945 (18). In Europe, dengue was reported in Greece (Athens and Piraeus) and Spain (Seville and Cadiz). It is difficult to establish the reliability of the reports of the Spanish outbreaks, since these occurred in 1784-1788 and in 1860-1868 (10, 19). The two outbreaks in Greece in 1927-1928 and 1929-1933, however, are confirmed by retrospective serological studies (16). Dengue was probably endemic in many Eastern Mediterranean countries at the end of the 19th century, including Lebanon, Turkey, Palestine, Syria, and unspecified neighbouring countries (18,20). Changes in the distribution of dengue have occurred in other parts of the world. More detail is provided below. The first reported dengue-like epidemic located in Africa occurred in Cairo and Alexandra, Egypt, in 1779 under the name Mal de Genoux. According to Carey and Scott this disease was probably chikungunya (21,22). Nonetheless, dengue epidemics were reported frequently in Egypt between 1824 and 1937. The disease appeared in Alexandra, Cairo, Suez, and Port Said (10-17,19,23). The last reported outbreak for Egypt was in 1937 in Cairo, where there were 2600 cases and 55 deaths. Kuno suggests that, of the early dengue reports, this was the more reliable (16). In the 1940s in North Africa, the Sudan and Egypt were considered endemic for dengue (20). The first report of dengue in the Sudan was reported to have occurred from 1914 to 1918 (24). Dengue-like outbreaks were also reported for Libya; at least one outbreak occurred in the mid 19th century and another in 1878 in Benghazi and Tripoli (10,18,19). Sudan reported an epidemic of dengue in 1985-86 in the Red Sea State (25). The first outbreak in south Kordofan, a central state of the Sudan region, occurred in 2005 (ProMED). Dengue was believed to have been introduced to Djibouti in 1991-1992 (26). From 1993 to 1994 dengue appeared again here during the winter (27). Hirsch identified a dengue pandemic in 1870-1873 (19). The outbreak was believed to have started and ended in East Africa. The outbreak began in 1870, in Tanzania. The disease was known under the names Dinga, dyenga or dengue and spread towards Egypt, Saudi Arabia (Jeddah, Mecca and Medina), Yemen (Aden), India, China, Indonesia, Indochina (Vietnam, Laos and Cambodia) and then back to Mauritius in 1873 (19). Despite the fact that outbreaks were reported for Tanzania at least four times between 1823 and 1926, the outbreaks of 1823 and 1870 are, according to Carey more likely to be chikungunya (10,18,21). We found pre-1900 reports for Mauritius (1851 and in 1873) and from 1897-1899, in Somalia (10,19). The first reported outbreak in Kenya appeared in 1860-1868. An early outbreak occurred in Eritrea at the same time as the Somalia outbreak (1897-1899). Unfortunately, the exact location of the outbreak in all these countries is not specified (10). There were outbreaks in Réunion in 1851 and during 1870-1873, and there was a likely outbreak in 1926, in the Seychelles, based on reports of local authorities (10,18). In the early 20th century, Mozambique and the Seychelles were said to be endemic (20). Robinson argued that dengue was relatively uncommon in East Africa before 1952 (28). Nonetheless, the author refers to several countries where outbreaks have occurred in the period from 1924 and 1950; Mozambique, Madagascar, Ethiopia, Somalia, and the Comoros (28). McCarthy and Bagster Wilson state that dengue was present in Ethiopia (Dire Dawa and Harrar), Somalia (Mogadishu), Madagascar (Diego Suarez) and in the Comoros Islands (Mayotte) and in other parts of Somalia (Kismayu, Berbera and Hargeisa) and Mauritius (29). In the Comoros, outbreaks occurred in 1943 and in 1948 (30). The Comoros, Ethiopia, Kenya, the Seychelles, Somalia, Tanzania, Réunion, Mauritius, and Mozambique were considered endemic from 1975 to 1996 (18). Outbreaks occurred in 1984 and 1993 in the Grande Comoros (30-32). Dengue occurs sporadically in Kenya (33-35). Somalia experienced four major outbreaks between 1982 and 1993 in Jubbaada Hoose (Kismayu), and in Shabeellaha Hoose (Afgoi), Banaadir (Mogadishu) (27,36-38). Both the Seychelles and Reunion had an outbreak in 1977-1979. In 2009 an outbreak in Mauritius was reported for all three islands. The vector predominantly responsible was Ae. albopictus, but a contributing role of Ae. aegypti is not excluded (30,39-42). In 1982-1983 an outbreak occurred in Pemba, Mozambique (43,44). For Tanzania, we found evidence of a dengue-like outbreak in the more recent period of 1952-1953, in the Makonde Plateau (23,28). This was probably the first dengue-like disease of this region and affected 60-70% of the population. This outbreak may have been chikungunya. Several common features of dengue were frequently absent, including rash, adenopathy and postorbital pain. In addition, joint pains were present for a long period of time. Both Ross as well as Mason and Haddow conducted confirmative studies and discovered presence of chikungunya (45,46). Our study did not uncover any notable outbreaks for Ethiopia. There was an outbreak in Eritrea in 2005 (3). In 1977 and 1986 presence of dengue in Madagascar was serologically confirmed (18). According to WHO, an outbreak occurred in 2006, in Madagascar, but we were unable to identify an original report (25). Before 1950 no endemic countries were named in the overview of van Rooyen and Rhodes for central sub Saharan Africa (20). We only found a short note on an outbreak that occurred in 1949, in the Belgian Congo (now Democratic Republic of the Congo) (18). Angola experienced an outbreak in 1986 (24). We found a report that dengue was endemic in the Democratic Republic of the Congo at least between 1952 and 1957, with a number of cases reported annually at that time (47). However, no reports on more recent outbreaks were discovered. An outbreak of dengue was reported in Gabon in 2007, where Ae. albopictus was the dominant vector (48,49). There were frequent outbreaks in Senegambia (Senegambia was a former confederation between Senegal and Gambia). Van Rooyen and Rhodes consider Gold Coast (now Ghana) and Dakar (Senegal) as endemic areas before 1948 (20). The first reported outbreak in Senegambia appeared in 1845, in Goree and St Louis, followed by an outbreak in 1848, and frequent outbreaks continued to be reported until 1920-1926. In Dakar an outbreak was reported in 1899 (10,18,19). For Ghana, an outbreak occurred between 1920 and 1926 in Accra (10). An outbreak appeared in 1926, in Burkina Faso, in Ouagadougou (18). Burkina Faso, Nigeria, Senegal, Cote d'Ivoire, Ghana, Guinea and Sierra Leone were considered endemic in 1975 to 1996. Between 1964 and 1973 three outbreaks occurred in Ibadan, Igbo-Ora and Abeokuta in Nigeria (50,51). The regions studied were the derived Savannah zone', The Southern Guinea savannah', the Rainforest', and the Plateau zone'. A high proportion of the population exhibited immunity in all regions (52,53). Dengue is endemic in the Kainji Lake area in Nigeria (54). Dengue is also considered endemic in Ibadan (55). In 1974 dengue was isolated in Senegal and in 1980, in Cote d'Ivoire. In the period 1974-2000 four outbreaks have been reported in Senegal (56,57). In Côte d'Ivoire an outbreak occurred in 2008. Several travellers returning from Abidjan and two local cases were diagnosed with dengue, indicating the introduction of DENV-3 in Côte d'Ivoire (25). The most recent outbreak identified for Senegal occurred in 2009 (according to ProMED). The first isolation of dengue virus in Burkina Faso was in 1982. From 1982 to 1986 dengue was present in the Kadiogo province of Ouagadougou, Burkina Faso (18,58). No recent epidemics were found for Ghana, Guinea and Sierra Leone; only sporadic cases have been reported according to GIDEON. Eisenhut et al. identified the first dengue transmission in Benin through a study among 670 German aid workers who worked overseas in the period of 1978 to 1993 (59). Thirteen of the 88 participants who had worked in Benin tested positive for dengue. In 2002 the first indigenous cases in Cameroon were reported, including two cases with a DENV-1 infection. The most likely vector was Ae. Albopictus (49). In 2008 the first epidemic in Mali, in the Keyes region was reported, including at least 70 confirmed cases of dengue (25). The original report was not identified, but in an overview by WHO a note was added listing that DENV-2 had been identified in travellers returning from Mali in 2008. In 2009 a number of dengue cases were reported in the Cape Verde islands for the first time, in Brava, Fogo, Maio, Santiago (50). The first reported dengue like outbreak of South Africa appeared in Natal 1901-1907 (10). An outbreak frequently mentioned in the literature occurred in Durban from 1926 to 1927. This outbreak was confirmed through serological testing (16,18,60). Although Blackburn et al. argue dengue has not been reported in South Africa since 1926-1927, an outbreak from 1940 to 1945 was identified by Gubler (10,61). For the period 1975-1996, South Africa was the only named endemic country in the south sub-Saharan African region. Blackburn et al. concluded that, although Ae. aegypti is present in South Africa, only imported cases from India have been identified since 1980 (61,62). No further reports on outbreaks for south sub-Saharan Africa were identified. According to the overview of Van Rooyen and Rhodes, the endemic countries of Asia in 1948 were India, Sri Lanka, Burma (Myanmar), Thailand, Malay Peninsula, French Indo-China (Cambodia and Vietnam), Dutch East Indies (Indonesia), China, Formosa (Taiwan), and Japan (20). The following countries experienced dengue activity from 1975 to 1996: Bangladesh, India, Indonesia, Maldives, Myanmar, Sri Lanka, Thailand, Vietnam, Brunei, Cambodia, Lao Peoples Democratic Republic, Malaysia, Singapore, Cook Islands, Fiji, French Polynesia, Guam, Kiribati, Marshall Islands, Nauru, New Caledonia, Niue, Palau, Papua New Guinea, Philippines, Samoa, Solomon Islands, Tokelau, Tonga, Tuvalu, Vanuatu, and Wallis Futuna Islands (18). Three major outbreaks are thought to have occurred in China before 1950. The first one includes an outbreak in Taiwan in 1930, followed by outbreaks in Shanghai, the Fujian province and the Guangdong province in 1940 (63). The third outbreak was in 1945 in the city of Wuhan, Hubei province; it affected 80% of a population of one million (64). In 1947 a suspected dengue outbreak occurred in Shanghai City and the coastal areas of Jiangsu, Zhejiang and Fujian Provinces (63). According to Kuno, Ae. albopictus was the transmitting vector (17). For all these areas, records on epidemics before 1900 are available. In Taiwan pre-1930, epidemics have occurred almost annually in the early period, the first one reported in 1870-1873 (10,16,17,19). Shanghai and the Fujian province were also affected (19). Dengue resurfaced in 1904 in Shanghai. Frequent outbreaks for Hong Kong were identified from 1876 to 1907 (10). Kuno lists two outbreaks for 1901 and 1902, which were most likely chikungunya (17,21). The earliest outbreak for the Guangdong province identified was in 1901 in Guangzhou (18). After the outbreaks of 1930, 1940 and 1945, no epidemics were reported until 1978 (63,64). Since the 1990s frequent outbreaks of dengue have occurred in Guangdong, Guangxi and Hainan. The first outbreaks for 32 years were reported in 1978-1979 in Shiwan, which is a town of Foshan City and in Zhongshan County, both located in the Guangdong province. The vector responsible for transmission was Ae. albopictus (63-65). In 1980 another outbreak occurred in the Guangdong province, affecting one third of the province. Here both Ae. albopictus (north of the province) and Ae. aegypti (in the south Hepu county) were the vectors. In 1982, outbreaks in Wuhang, Hubei province and Shanghai have been reported (18). In Hainan Island in 1979-1980 an outbreak affected over 400,000 individuals (63,65). Besides Guangdong, Guangxi and Hainan, Taiwan has experienced outbreaks of dengue since the 1980s. A major outbreak affected Kaohsiung in 2001-2002 (66,67). In 2004 an outbreak of dengue occurred in Ningbo, Zhejiang province, which was not considered an endemic area. 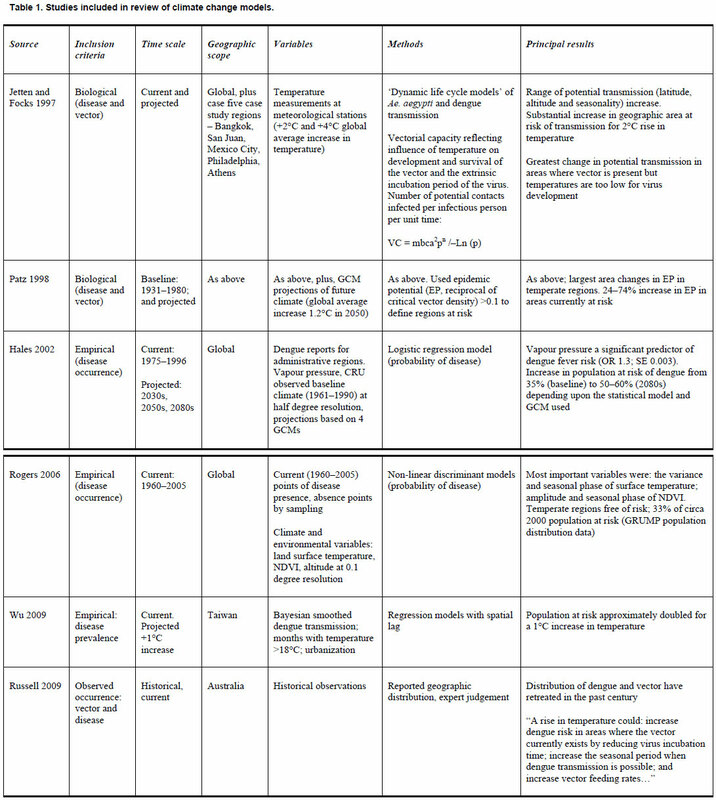 In total 83 cases were reported, and of these 68 were laboratory confirmed. The authors suspect that dengue was introduced by a traveller who returned from Thailand and the Ningbo area, which had a high density of Ae. albopictus at that time (65). Liu et al. demonstrated the presence of dengue in Dushan and Xingyi (68). Other areas that experience dengue epidemics are Fujian and Yunnan provinces. In Fuzhou, Fujian province, an epidemic of dengue occurred in 2004. Yunnan province had outbreaks from 1981 to 1982, transmitted predominantly by Ae. albopictus. In 2008, another outbreak of dengue occurred in this region (ProMED). Macao experienced an outbreak in 2001 where Ae. albopictus served as primary vector (69). Epidemics were reported in the late 19th century in the states of Queensland, New South Wales, Western Australia, and in the Northern Territory. The first occurrence of dengue in Australia is reported to have occurred in 1873, from eight infected travellers from Mauritius. In 1879 and 1885 the first local outbreaks of dengue occurred in Queensland, in the towns of Townsville and Rockhampton respectively (70). Besides frequent epidemics in Queensland, the disease was introduced for the first time to New South Wales in 1886, and appeared again in 1898. These may have been isolated imported cases rather than true local outbreaks. Dengue epidemics in the state of New South Wales were reported for the first time in 1905. In 1925-1926 there was a widespread outbreak from Newcastle (coast) to Tamworth (inland) and Bourke (west) (16,70). The epidemic of 1942 is considered to have been the last epidemic in New South Wales, which may have been facilitated by the movement of army troops by steam train (70,71). In the Northern Territory at least two outbreaks occurred in 1914 and in 1920 (70). In 1914 dengue was identified in the Territory's capital, Darwin. From 1909 until 1927, dengue cases were reported in the state of Western Australia. Outbreaks occurred nearly annually in Broome, Wyndham, and Carnarvon and surrounding areas (17,70). After a large epidemic in 1954 to 1955 that appeared in Townsville, north Queensland, dengue outbreaks were absent for a period of 26 years (72). The outbreaks returned in North Queensland in 1981-1982 (73). Mackenzie et al. provide an overview of dengue outbreaks in the period of 1990 to 1998 and argue the epidemics have been limited to the north Queensland area, i.e. from the Torres Strait south to Cairns, Townsville and Charters Towers (74). In 1992-1993 a dengue outbreak occurred in Townsville and Charter Towers; in 1996-1997 in Torres Strait; 1997-1998 in Cairns (74-76). The most recent epidemic that occurred in Cairns and Townsville, in 2008-2009 was much larger and more difficult to control than previous outbreaks (77). Dengue was endemic in much of the Eastern Mediterranean including Lebanon and Palestine at the end of the 19th century (18). At present, Turkey, Palestine, and Syria and unspecified neighbouring countries are thought to be endemic (20). From 1870 to 1873, dengue-like epidemics occurred in the Arabian peninsula in Yemen (Aden), and Saudi Arabia (Mecca, Medina and Jeddah) (78). Israel, Turkey (Smyrna and Istanbul), Palestine, and Syria were affected by a dengue outbreak from 1889 to 1890 (10,18). This outbreak may have been related to the slave trade (18). After this pandemic, dengue was recorded only in Lebanon, Israel and Yemen. An outbreak was reported for Lebanon in 1907-1913 and in Beirut in 1945 (79). The 1907-1913 outbreak occurred also in Israel (Jerusalem). From 1920-1926 Yemen (Aden) experienced another outbreak (10). 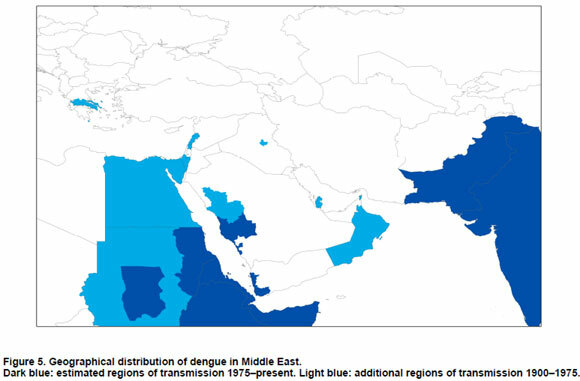 Dengue was said to be endemic in the 1960s in Qatar, Iraq and Oman (47). Saudi Arabia and Pakistan were also considered endemic (18). The current situation in the Middle East is discussed in the following sections with particular reference to Kuwait, Pakistan, Saudi Arabia, and Yemen. Al Nakib et al. observed dengue in Kuwait between 1980 and 1982, but the authors did not focus on whether the infections concerned locally acquired or imported cases (80). However, Pacsa et al. argue against local transmission of dengue infections in Kuwait because of the absence of the Ae. aegypti mosquito and the inability of the local vector, Ae. caspius to transmit dengue effectively (81). The dengue cases that occurred in Kuwait had all arrived from dengue endemic areas. In a follow-up study the authors tested 499 samples from residents from Kuwait for dengue from 1997 to 1999. Participants that had not left the country were all found to be negative for dengue (82). Serologically confirmed cases of dengue were reported in Karachi in 1994 and another outbreak appeared in this city in 2006 (83-86). Pakistan was considered non-endemic until 1993 but is now considered endemic (83). 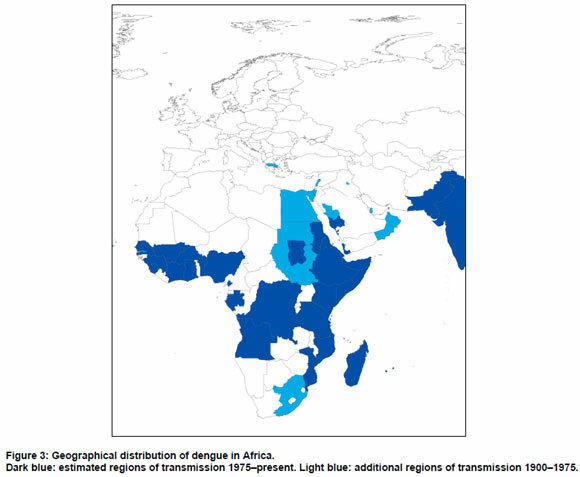 Since 2005 there have been outbreaks of dengue DENV-3, leading Khan et al. to conclude that dengue is now hyperendemic in Pakistan (87,88). Paul et al. interviewed 76 employees of a power plant in Baluchistan in 1995, where an outbreak of a febrile illness had occurred, confirming an outbreak of multiple serotypes (not further specified) in this largest province of Pakistan (89). The vector responsible was most likely Ae. aegypti. The authors argue that their results prove the presence of epidemic dengue in southern Pakistan. In March 1994, dengue was isolated for the first time since the outbreaks of the 19th century in Jeddah, the Makkah province of Saudi Arabia (78,90,92). Zaki et al. refer to four outbreaks between 1994 and 2006; 1994, 1997, 2004 and 2005-2006. Recently in 2009 an outbreak was documented in Jeddah (ProMED) (90). That three serotypes of the dengue virus are established and circulating in the country might indicate that dengue has become endemic in Saudi Arabia (90). Ayyub et al. concluded that dengue is endemic in the region of Jeddah (93). An epidemic of dengue in was reported to have occurred in 1954, which affected 98% of the population of Al Hudaydah (47). In 1984 a traveller returning from Yemen was serologically confirmed to have had dengue (94). Dengue is endemic in much of South America, Central America and Mexico. The regions bordering the current distribution of dengue are discussed in detail below. In 1905, 1911 and 1916 dengue cases were reported in northern Argentina in Chaco, Corrientes, Formosa, and Misiones provinces. In 1916 an epidemic occurred in Entre Rios province without any haemorrhagic symptoms (18). Gubler reports an outbreak here between 1914 and 1918 (10). In 1963 dengue transmission was interrupted in Argentina through the Ae. aegypti eradication campaign, which was initiated in 1955 (95,96). In 1986, Ae. aegypti was reported to have reinvaded north Argentina (95-97). Aviles et al. reported imported cases of dengue from Bolivia, Paraguay and Brazil in the Salta Province but also identified 19 indigenous cases of dengue in Oran, Tartagal, Guemes, and Salvador Mazza in 1997 (96). Natiello et al. report an outbreak of 341 cases in 1998, in the Salta Province (98). Another outbreak occurred 1999-2000 with close to 500 cases in Misiones and Formosa, the north-eastern region on the border with Paraguay (99). Between 1997 and 2001 indigenous cases appeared in the Salta province, the Jujuy province and Formosa province (97). Natiello et al. state that dengue has only recently been present in the northern provinces of Argentina (98). Imported cases are often identified in Buenos Aires, mainly due to native Paraguayans living in Buenos Aires visiting their home country (98,99). Natiello et al., who identified dengue in Buenos Aires, concluded that no local transmission has occurred in the area, and moreover, that the conditions in this city are not suitable for optimal transmission (100). However, in 2007 the first case of dengue with no travel history to endemic surrounding countries was identified. Between 1998 and 2007, 4,719 cases of dengue were reported by Argentina, mainly in Salta, Formosa and Misiones (95). Gubler reports an outbreak in northern Chile between 1914 and 1918. In 2002 and 2007 there were two localized outbreaks of dengue on Easter Island (10). Before the 2002 outbreak, dengue fever was diagnosed in 15 cases from continental Chile in 2000 and 2001; but no locally transmitted cases have occurred (95,101). Vezzani and Carbajo argue that Uruguay has been the only South American country where locally transmitted cases of dengue have been absent (95). No further reports or literature on indigenous transmission or outbreaks in Uruguay were identified. The first documented cases of dengue-like illness in the United States were reported by Rush and concerned an outbreak in Philadelphia, Pennsylvania in 1780 (12,21,102-104). From 1826 onwards, widespread outbreaks of dengue-like illness appeared in the southern states, including Florida (Pensacola and other cities), Georgia (Savannah and Augusta), Louisiana (New Orleans) and in Texas (Santa Cruz) (10,16,18,19). In the northern and central states only sporadic cases were reported. Dengue became more widespread in the southern states in 1850 with Alabama (Mobile), Mississippi (Vicksburg and Woodville), Texas (Galveston, Houston and Brownsville) and Missouri (St Louis affected) (10,19,60). Alabama, Florida, Georgia, Louisiana and Texas continued to experience dengue epidemics for several decades. In Louisiana in 1945, an outbreak is thought to have been related to war veterans who returned from the Pacific (18). An outbreak in Florida took place in 1934-1935 in the Tampa and Miami areas (18,105). Georgia and Alabama also experienced outbreaks in 1934-1936 (24). Whereas most dengue cases that have been reported in the United States since 1940 are imported, local transmission of the dengue virus occurred in Texas in 1986 (in Brownsville, Corpus Christi and Laredo) and 1995. Gratz and Knudsen report an outbreak in 1980, based on information of the Pan American Health Organization (PAHO) (18). Between 1997 and 1998, 18 cases were diagnosed, all imported into Florida from endemic areas (105). However, in 2009 indigenous dengue transmission occurred in Key West, Florida (9). In August 2009 three cases were identified to have acquired the disease locally, and by November, 91 cases tested positive for dengue by the USA Centers for Disease Control and Prevention. In 2001, an epidemic of dengue occurred in Hawaii after an absence of over 50 years (8). 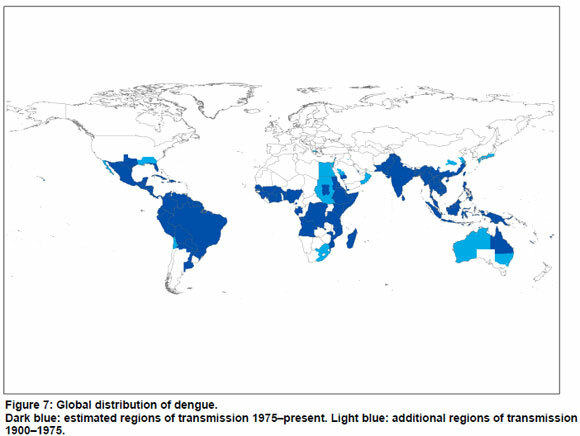 Estimated regions of dengue transmission from 1900 to the present, and from 1975 to the present are summarized in Figure 7, in which estimated regions of dengue transmission for 1975-present are shown in dark blue; additional regions of dengue transmission for 1900-1975 are shown in light blue. The map is based on the systematic review in the present paper, and (for 1975-present), a recent map published by WHO (3). Where there were differences between our findings and the WHO map, the WHO map was assumed to be correct. The search of PubMed yielded 45 articles and of Scopus 509 journal articles. Thirty-eight of the 554 articles from the combined searches were duplicates, leaving 516. One hundred and seventy-one of these papers were on unrelated topics or did not consider the relationships between the vector or the pathogen and environment (e.g. they were about clinical presentation, vaccination and therapies, viral genetics, larvicide development and mosquito control methods), leaving 345 papers. Six papers met the eligibility criteria (see Figure 8). These six papers are summarized in Table 1. Another 30 papers focused on other variables relevant to climate change - e.g. interannual variability or the urban landscape - but did not model the effects of climate change. There are two broad classes of vector-borne disease model: those based on theoretical considerations (also known as mathematical or biological models) and those based on statistical methods (also known as empirical models). Here, m is the number of female mosquitoes per person, b is the probability that an infectious mosquito transmits dengue while biting a susceptible human, c is the probability that a mosquito acquires a dengue infection while biting a viraemic human, a is the number of bites per person per day, n is the duration of the extrinsic incubation period (EIP), and P is the survival rate of the mosquito (106). Setting VC=1, the epidemic potential (EP) is the reciprocal of the critical vector density. Given a hypothetical 2-4°C increase in temperature, both the range of transmission (latitude and altitude) and the length of transmission season were projected to increase, and this was expected to reduce the average age of infection. A lower average age of infection (caused by increased transmission risk) may lead to a greater number of cases of severe dengue, as there is greater likelihood of multiple infections over a lifetime with different serotypes. This would increase the burden of the disease on individuals and increase the number of deaths from dengue (106). The authors concluded that the model would be most accurate for regions bordering endemic regions, where there are vulnerable people and vectors but transmission is currently limited by temperature. Hales et al. used an empirical approach based on the reported distribution of dengue between 1975 and 1996 (107). The geographic limits of dengue fever transmission were modelled using observed long-term average vapour pressure, a climate variable which depends upon both rainfall and temperature. GCM projections of vapour pressure were used to estimate climatic suitability for transmission in the 2030s, 2050s and 2080s. Rogers et al. fitted non-linear discriminant models to the observed geographic distribution of dengue (points of dengue presence 1960-2005) (103). The most important predictor variables were the variance and seasonal phase of surface temperature, and the amplitude and seasonal phase of the normalized difference vegetation index (NDVI). About 33% of the global population, in tropical and subtropical regions, was estimated to be at risk, based on a modelled probability of dengue transmission of greater than 50%. Wu et al. used regression models incorporating spatial lags to fit climate and environmental data to smoothed rates of dengue notifications (1988-2002) within Taiwanese townships (108). Months with temperature >18°C and urbanization were important predictors. The estimated "population at risk" (the number of people living in transmission risk zones) approximately doubled for each 1°C increase in temperature. The findings of theoretical and statistical models of dengue and climate are broadly consistent: the transmission of dengue is highly sensitive to climate. Relatively small increases in temperature (of the order of 1°C) can lead to substantial increases in transmission potential. No studies have modelled the effect of climate trends on dengue transmission over the past century. Dengue is endemic in urban populations in tropical countries. Large epidemics of dengue have occurred less frequently in subtropical regions, and rarely in cities in temperate regions. Although the exact boundaries of current and historical transmission are impossible to establish with certainty, we conclude that - despite increases in the geographic distribution of dengue in recent decades - the current distribution of the disease is less extensive than its historical limits. This geographic contraction has occurred at the same time as increases in incidence in many countries. Recently, local transmission of dengue has been reported for the first time in several African countries, Bhutan, Nepal and France (5-7). With the exception of the French outbreak, which consisted of only two cases, it is difficult to be certain whether these reports represent geographic spread of dengue, or the result of increased awareness and reporting. On the other hand, dengue has returned after many decades of absence in Hawaii and Florida, USA (8,9). 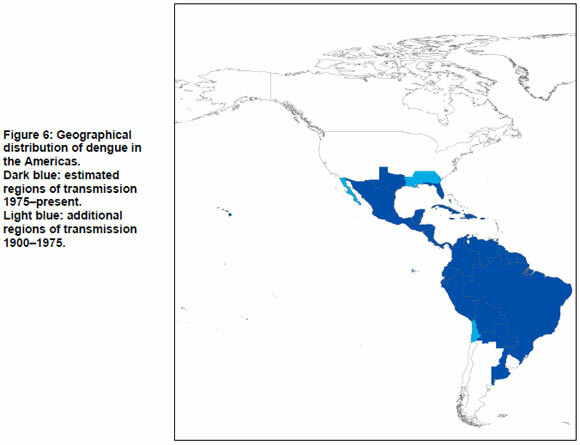 Areas of geographic contraction of dengue, compared with historical limits, include the southern states of North America, much of Australia, parts of southern Europe and Japan, China and South Africa. Provision of piped water supplies and removal of water storage tanks for domestic and other uses, other changes in housing conditions (window screens and air conditioning) and targeted vector control measures have plausibly contributed to this geographic contraction. Contraction of the geographic distribution of dengue has occurred despite overall increases in temperature over the past century. Increases in poor urban populations, greater human travel and trade worldwide, and breakdown in public health measures may be primarily responsible for expansions in geographic range and increased overall incidence of dengue in recent decades. Has climate change played a role in the resurgence of dengue? Surface temperatures have increased by a global average of 0.75°C in the past century. Our best scientific understanding is that temperature increases of this magnitude are associated with substantial increases in dengue epidemic potential. Given that transmission also depends on the interaction between numerous non-climatic local factors (e.g. breeding sites, shelter, urban features, poverty, surveillance and control measures), the impact of climate change cannot be quantified, based on current evidence. On theoretical grounds, however, climate trends will have exacerbated the effects of other factors at least in some areas. Studies modelling the potential effects of climate change on dengue project that there will be increases in climatic suitability for transmission and an expansion of the geographic regions at risk of dengue during this century. The theoretical models are particularly useful in defining the outer climatic limits of transmission and the potential rate of transmission in the absence of limiting social and other environmental factors. The empirical studies are useful in that they derive from patterns of actual occurrence of transmission and thus include, in a crude manner, the numerous human and smaller scale environmental factors that contribute to dengue transmission. Such models may underestimate dengue potential in some areas, while the theoretical models may overestimate potential in areas that have, for example, effective control measures in place. Neither of these two types of models account for the future distribution or effectiveness of factors that limit transmission. Whether or not climate trends are indeed partly responsible for the recent resurgence of dengue, models of the impact of climate change can indicate the future population at risk of dengue, within the limitations of the modelling approach. The main limitation is that the models project the climatic suitability for transmission. They do not predict disease occurrence, which depends upon several limiting or enhancing factors in addition to climate. These projections can only be considered estimates of areas suitable for transmission, under the assumption that today's relevant non-climate factors (e.g. housing quality and water supplies, levels of poverty, public health, surveillance and control measures) do not change over the coming century. Mathematical models of dengue do not account for the effect of non-climate factors. Empirical models of spatial patterns of dengue partly account for the effect of non-climate factors. This is because the geographic distribution of dengue on which these empirical models are based is limited by the actual presence of all necessary factors (vector, virus, susceptible human population, local physical and social features). If vector, virus or human populations are absent from any regions or countries that are climatically suitable for dengue, resulting models will underestimate the geographic region that is climatically suitable. Existing models of dengue transmission provide limited, incomplete, but useful, projections of disease risk. Spatial models could be improved by considering the historical distribution of vectors and/or disease transmission, by incorporating data on disease prevalence in addition to laboratory data on vector responses (breeding, feeding, survival), and by considering local factors such as urbanization, population density, poverty, mosquito control, water storage systems, travel and migration, housing conditions and air-conditioning (109). Analytical studies incorporating both climate and non-climate factors are now required, in order to assess the significance of climate change as a driver of the emergence of dengue in the past 50 years. As detailed geographic information on these factors is not available for most countries or time periods, use of proxy variables such as gross domestic product per capita may be helpful in improving models of dengue transmission. There are hints that dengue may be returning to areas that have been free of the disease for many decades. Dengue surveillance and control systems need to be strengthened, especially in poor countries and on the fringes of current endemic regions. Although climate change has not had a clear effect on the geographic distribution of dengue in the past century, this does not imply there has been no effect, or that the future impact of climate change on dengue can be ignored. Historically, control of dengue has been, at best, difficult to sustain. Since global climate change is a progressive and potentially irreversible phenomenon, prudent policy requires that we stabilize the global climate as soon as possible. Otherwise, control of dengue will be harder to achieve, even under optimistic scenarios of future development. Geographic limits are difficult to establish with certainty, due to reliability issues with the available data on historical outbreaks, as well as the poor reporting of dengue epidemiology to date. The current distribution of dengue appears generally less extensive than the historical limits of the disease. No studies have yet quantified the impact of climate change on the historical distribution of dengue. This is an important research gap. Existing models project increases in climatic suitability for transmission and an expansion of the geographic regions at risk of dengue in the 21st century. Reporting of dengue remains poor and adequate figures on dengue epidemiology are sparse. However, they will be crucial for future predictions of dengue spread. For this reason we emphasize the importance of improving the reporting system for the disease. Factors associated with urban poverty  such as poor housing quality and stored domestic water, along with a minimal capacity for surveillance and control measures  remain important promoters of dengue transmission within favourable climates. Further understanding of the disappearance, or the emergence, of the disease in particular areas might provide additional insight into the (potential) global distribution of dengue with climate change. Improvement of existing spatial models of disease transmission by considering the historical distribution of vectors and disease transmission, as well as accounting for local factors (e.g. urbanization, population density, poverty, mosquito control, water storage, travel and migration, housing conditions and air-conditioning).